There’s always that horror movie that manages to gain quite a bit of word of mouth, but you’re not really sure what the movie is about. This year, that film would be Horsehead. 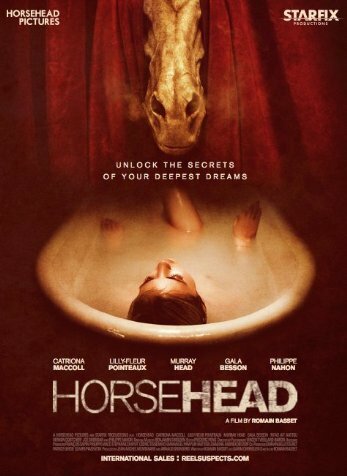 Everyone is seeing Horsehead and talking about how beautiful and amazing it is, but no one really talks about the story. I’m as visually stimulated as the next person, but if a movie is only beautiful, it’s still wasting my time. A lot of people have been throwing around Mr. Argento’s name while describing Horsehead and comparing it to Suspiria, but I find that to be misguided. Yes, it is a rich looking film with stunning visuals and gorgeous makeup, but it also features a female protagonist who has more than one layer and the story follows a linear path despite all of the grandiose imagery thrown into the middle of telling the story. It is my extremely unpopular opinion that the same cannot be said for Suspiria. J. Hoberman of The Village Voice famously described it as "a movie that makes sense only to the eye” and I couldn’t agree more. Horsehead does not suffer this same folly. Starring Lilly-Fleur Pointeax as Jessica, a girl who is traveling home after hearing of the death of her maternal grandmother, she is also a woman dabbling in the psychology of lucid dreaming. Of course, all of this is going to collide in a beautifully horrific way all while unearthing the secrets of Jessica, her mother and her grandmother. The spooky, low-lit atmosphere full of rich gem tones is immediately set with an especially luxe opening sequence where we are immediately introduced to Horsehead. I must take this opportunity to gush over the costume and makeup that went into Horsehead. This is beautiful work through and through. Later, when you get to peek under the mask, the makeup is lovely and the added touch of seeing the breath from the Horsehead is the cherry on top. In fact, everything about this film is gorgeous and it’s why I brought up that review of Suspiria. Fortunately, there is definitely more substance here, but not by much. The storyline is the usual religious fanatical patriarch who chooses dubious methods of parenting and the effects ripple all the way down the family tree. Conveniently, the deceased grandmother is laying on the bed in the room next to the one that Jessica is staying in, so when Jessica begins toying with lucid dreaming, her grandmother easily enters her dream realm. The dream sequences are reminiscent of 90’s era grunge videos and I say this in a, mostly, generous manner. At times, some of the imagery and symbolism is a wee bit heavy handed, but this is all easy to forgive because Romain Bassett has directed a truly gorgeous film that is almost overwhelming in it’s visual beauty. The best part about all of this is the fact that there is so very little CGI used here. Horsehead is beautiful by virtue of everyone who worked on it paying careful, loving attention to detail. So, while the story is nothing new, the style won me over and this definitely seems like the kind of film that just gets better and better with each subsequent viewing.